Keep your company a great place to work by creating a respectful workplace for all employees. Use this quick form to request more information. If you have an employment law question, please go to our Ask The Lawyers page and see if your question has already been answered or submit a new question there to our employment law attorneys. You may also call us directly at 800-458-2778 and we’ll be happy to answer your questions. Managing Within the Law leads to lower employee turnover, and therefore higher customer satisfaction, which in turn drives profits. Good managers determine if people stay or go. This program teaches managers to live the company’s values, build consistency and trust across managers’ teams, develop and practice effective communication, and create a respectful workplace for all. This classroom training is updated annually and includes your organization’s policies and procedures, small group discussions, video vignettes, skill building exercises, extensive Q &A and case studies based on actual legal cases. Our instructors are seasoned attorneys and highly engaging facilitators who use personal stories and appropriate humor to make these topics come alive! This workshop is designed for a national audience and is compliant with CA, CT and ME harassment laws. To find out more about our national HR training programs or to book a workshop, please call 800-458-2778 or email training@fairmeasures.com. Managing Within the Law is an essential skills program that is a key component of every new manager’s training curriculum. It also is an engaging refresher for the experienced manager. This program teaches managers to live the company’s values, build consistency and trust across managers’ teams, develop and practice effective communication, and create a respectful workplace for all. 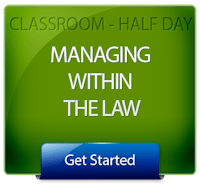 Managing Within the Law is updated annually and includes your organization’s policies and procedures, small group discussions, video vignettes, skill building exercises, extensive Q &A and case studies based on actual legal cases. Our instructors are seasoned attorneys and higly engaging facilitators who use personal stories and appropriate humor to make these topics come alive! Fair Measures offers this training in a full-day format or as a webinar, and we offer a 2nd day of training for more experienced managers. 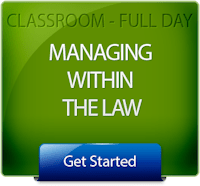 Managing Within the Law is an essential skills program that is a key component of every manager’s training curriculum. This program teaches managers to live the company’s values, build consistency and trust across managers’ teams, develop and practice effective communication, and create a respectful workplace for all. 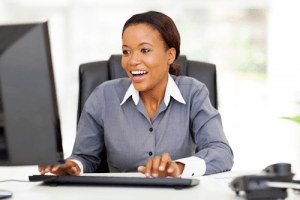 Our web classes have all the advantages of live training – because they are live – without the cost, time and travel of the traditional classroom. This on-line training program is highly interactive, using humor, polls, stories and cases to ensure learning and practical application. We feature excerpts from outstanding video programs that demonstrate the complexities of these issues. Our instructors are seasoned attorneys, experienced trainers, and skilled facilitators who use personal stories and appropriate humor to make these topics come alive! Fair Measures offers this training as a classroom training and we have a 2nd day of training for more experienced managers. 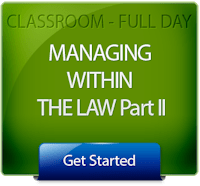 Part II of Managing Within the Law is a follow on course to Managing Within the Law. 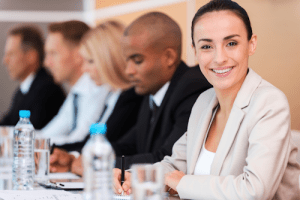 This workshop results in legally astute managers who confidently navigate the ongoing challenges of accommodating employee needs while meeting their production and output objectives. Key areas covered include leaves of absense and accomodation, corporate ethics, privacy, overtime pay, exempt versus non-exempt status, contractor and temporary employee rights, internet and email issues, managing telecommuters, and understanding manager’s rights. – L&D Manager, NetApp, Inc. This classroom training includes: Your organization’s policies and procedures, video vignettes, small group discussion, case studies and extensive Q & A. Our instructors are seasoned attorneys, experienced trainers, and skilled facilitators who use personal stories and appropriate humor to make this topic come alive! I was out of work for a surgery on my foot, is it okay for my boss to mock me on my return? Is it too late for me to file a harassment complaint? My boss was looking at pictures of the inside of my house online, is that illegal? Free Subscription to Fair Measures eNews!